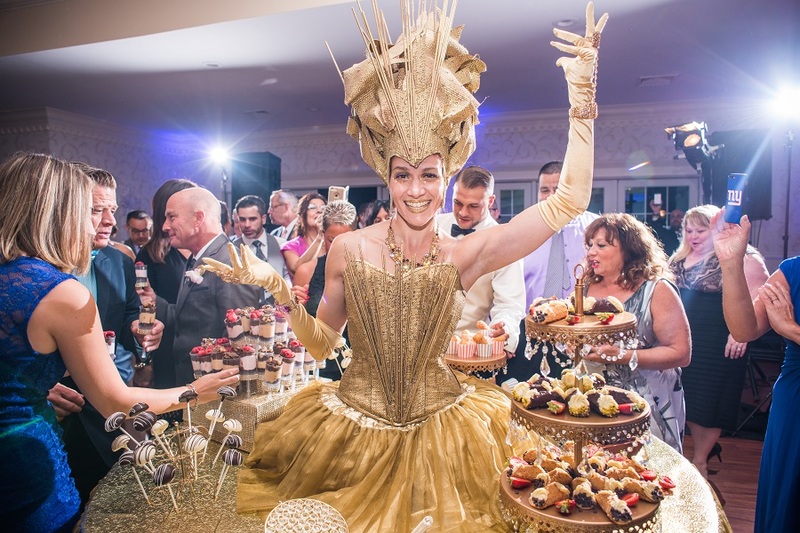 This is one you’ll have to see in it’s entirety to believe but here’s a preview: Details include a helicopter ride, delish signature drinks, breathtaking decor, perfectly-timed fireworks and a woman wearing a table skirt… literally. Kyle and I originally met during the summer of 2008 at the beach where he was with a group of his friends whom my friends and I went to school with. Afterwards, we would sit together and hang out throughout the summer. The first time we met, Kyle told his best friend that I was the girl he was going to marry one day. Who would have known that he’d be right! I was dating someone else at the time, so we did not actually have our first date until two years later in April 2010 but we have been together ever since. Your wedding had so many cool details from the helicopter ride to the breathtaking centerpieces — how long did it take you to plan all of this? Kyle and I were engaged in August 2013 and did not tie the knot until September 2015. We planned for a little over two years. 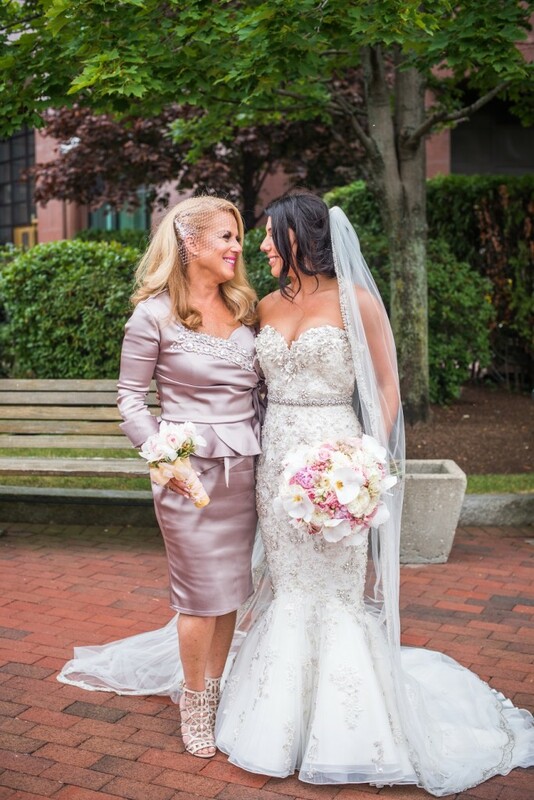 I could NOT have planned this wedding without Pam at The Enchanted Florist, who happens to also be my mother. I sat down with her and told her my vision from start to finish, which I had been Pinterest planning for quite some time, and she made it a complete reality x 10. I was very fortunate to have a mother who has been party planning since I was a child, so this is second nature to her. I was able to put it in her hands and know I did not have to worry about a thing. She made my dream a reality and nailed every single detail to perfection. Let’s start with your ceremony arrival, who are these guys? Those men are two of the amazing trumpeters from King’s Brass based in New York. 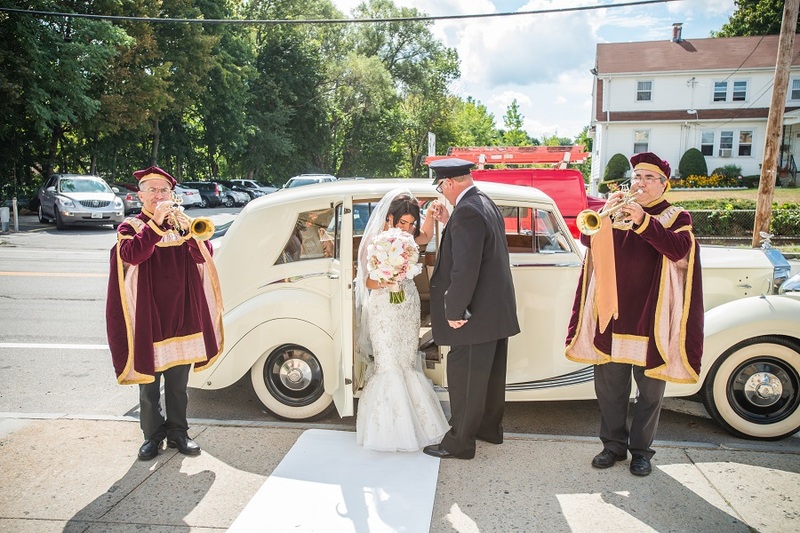 They greeted guests as they arrived at the church, and also played the processional/recessional music that the bridal party and I walked down the aisle to. 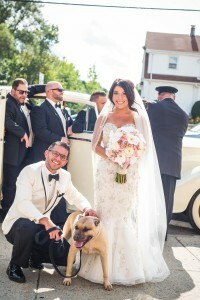 Is that your dog hanging out in some of your post-ceremony photos? What is his/her name? That is our beloved dog, Raider. She is fifteen years old and the love of our lives. We were thrilled when two of our friends sacrificed leaving our ceremony to make sure she was outside when we left the church. Our day would not have been the same without her. What made you go with Hillside Country Club as you reception venue? Beyond the fact that Hillside had a newly renovated ballroom with beautiful hardwood floors, sparkling chandeliers and floor-to-ceiling views of the golf course, they were willing to completely work with me to hand-pick a custom menu for the wedding, which was extremely important to me. Some of the options where chosen straight from their menu and some were customized personally to my taste. 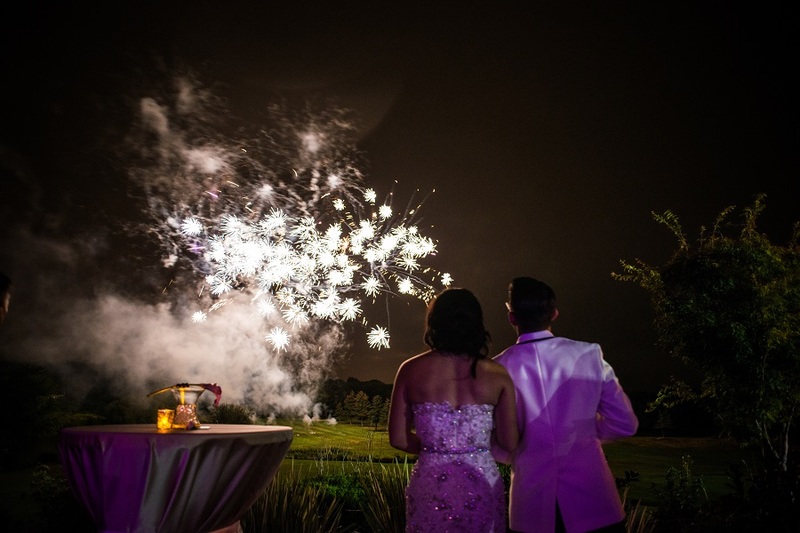 The package we chose offered some pretty amazing incentives, such as a fireworks display and a grand entrance by helicopter, which of course we took advantage of! I could not speak more highly of any venue or Ashley, their event coordinator. The food, service and ambiance were impeccable and if I could do it all over again, I would choose Hillside in a heartbeat. How would you describe the overall look of your wedding? I knew I wanted the overall look to be feminine, soft and glamorous with a color palette of gold, cream and soft pink tones. White fabric adorned the walls and show-stopping floral arrangements complimented my three distinctly different style table settings, which instantly captured your attention the minute you walked in the room. In my opinion, one of the most important elements of the wedding is the décor/ambiance of the room, from the fold of the napkin to the gold silverware, The Enchanted Florist helped me achieve my vision to perfection. I’ve never seen a sweetheart table done the way you did yours and I ADORE it. Who came up with the design? 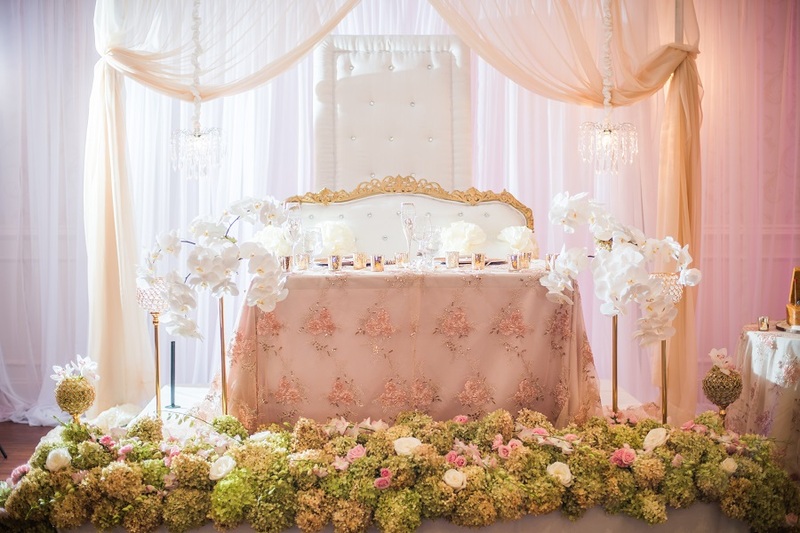 The sweetheart table was the combination of both myself and my mother’s vision. I knew I wanted it very romantic with white fabric, chandeliers, candles and and a tufted backdrop. She came up with the floral design, of course. I loved that it was elevated. At so many weddings, I can never see the bride and groom. It gave us an opportunity to oversee the entire room and interact with our guests. Who is she, where is she from, how did you hear about her services and how on earth did she balance those desserts on her skirt?! The company is called The Screaming Queens out of NYC. I had once seen a version of this of an episode of David Tuttera and loved the concept. My mother did some investigating and located this company. We were able to custom choose the costume to match our theme. The rolling table is actually part of her costume and she was able to turn completely around while in the table, strolling the room. She truly was the hit of the party and completely unexpected by everyone. One of Kyle’s favorite moments was the helicopter (which is owned and operated by the owner of Hillside Country Club) ride. 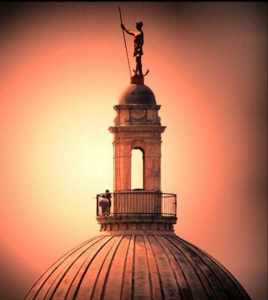 We were fortunate enough to fly over the state house where we were engaged two years prior and to see everything come full circle from our engagement to our wedding day was surreal. 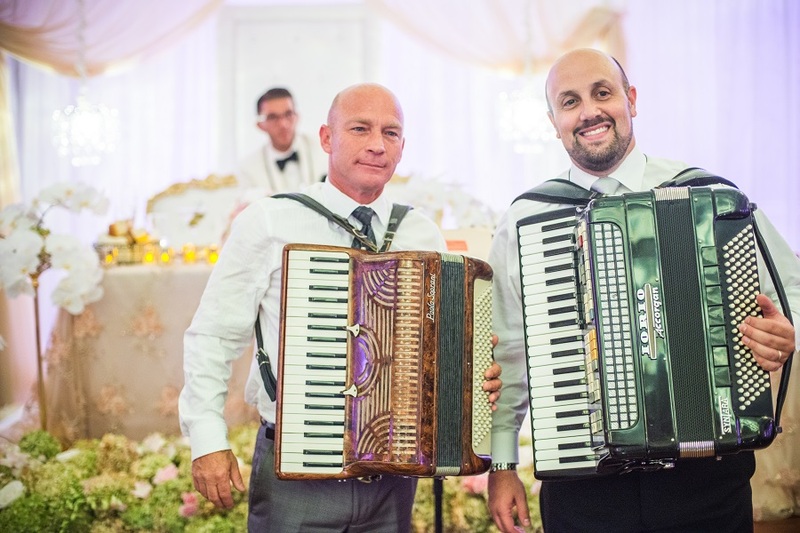 One of my favorite moments was the surprise accordion serenade outside my bedroom window the night before the wedding from my Uncle Greg and Ambrosiani member, Mike Meresi, and then again at our reception for our guests to enjoy. My grandfather was a world renowned accordion player who taught students at his studio until he passed away three years ago, leaving it to Mike. It was very sentimental and special to honor my grandfather, who I wish could have been there more than anything in the world. Did you run into any issues? How did you overcome them? 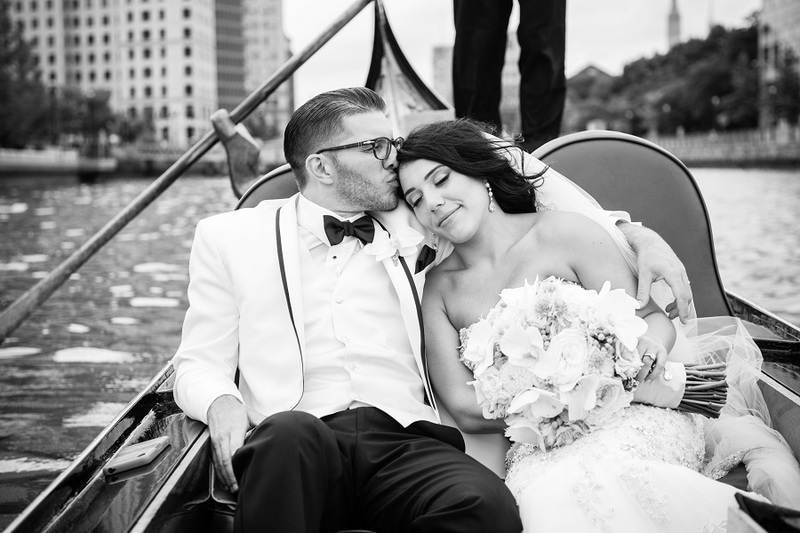 The day almost went off without a hitch! The only hiccup came at the expense of our limo company (not the same company that we had contracted for the Rolls Royce). We had contracted to have a blue Trolley pick us up from the church to take pictures at Water Place Park. The day of the wedding, they called to let us know that the trolley was not running and they had nothing to replace it with. They proceeded to give us a cramped limo with a broken air conditioner. It was an 80 degree day and much of the wedding party felt ill from lack of air. They were not professional when dealing with the situation but in the end they did not charge us for their services. It was a bummer that we couldn’t take pictures with the trolley like we envisioned, but we didn’t let this minor setback ruin the day. Any advice for recently engaged couples? Although it is difficult to do, enjoy every moment because it goes so quickly! Slow down every once in a while and take it all in. Make sure to eat! After all, you spent so much time meticulously picking out that menu, take the time to sit down and actually try it. Enjoy every step of the journey and surround yourself with excellent professionals to assist you in this process. Always remember….if you get stressed, you’ll look back on it one day and smile.